Dedicated to Biblical Hebrew language learning. We offer courses and resources for studying the Hebrew language and Bible world view. Hebrew distance learning materials are available on tape, CD, MP3, flash card, printed texts and online. We also supply Biblical & Modern Hebrew teach yourself software and Hebrew grammars. We have 500+ students on 5 continents and offer email and postal tutoring. Study Biblical Hebrew Online . Learn to read the bible in its original language via face-to-face over the Internet tutorials with Israel's best language teachers. Trial lessons available. Accredited by The Hebrew University of Jerusalem. Highly recommended! Local Hebrew classes in East Anglia (UK), during 2015/16. Course material from the Psalms in Hebrew available for distance learning. Includes everything you need to master reading, writing, analyzing, and translating Biblical Hebrew! Featuring 28 interactive and dynamic lessons and 150 hours of tutorials, Biblical Hebrew contains a wealth of fascinating information, including summaries of each book of the Bible and a colourful atlas of Biblical maps. Also includes a Hebrew audio dictionary. Updated list of further Jewish software and Hebrew software. The premier Hebrew, Greek, Aramaic, Latin & Syriac biblical and original language exegesis software. With recurring word usage pattern collocation tables. now supports Unicode SBL and SIL Greek and Hebrew fonts with full export and improved built-in wordprocessor. Hebrew & Greek vocabulary learning flashcard modules, grammars including Introduction to Biblical Hebrew Syntax (Waltke & O’Connor), and A Grammar of Biblical Hebrew (Joüon & Muraoka), Futato's Basic Hebrew Grammar. These electronic texts include the full text and graphics of the print editions and are closely linked to the Biblical texts in the program. Also Holladay, BDB-Gesenius Hebrew Lexicons. The Theological Wordbook of the Old Testament (Harris, Archer, Waltke). Updated Hebrew word studies: deleth - 'door, hanging, poverty'; We are running a free weekly word study by email mailing list, click to join. Updated New Testament application pages: The Beatitudes as Hebrew poetry, Matthew's Hebrew Gospel, and, Love your neighbour but hate your parents?, The camel and the eye of the needle. Major site update coming soon, click to be kept informed. - guaranteeing you Amazon prices with our expert selections. 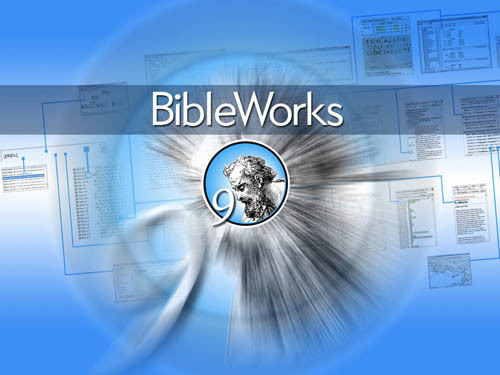 Pick up Hebrew & Bible software at our sister site bmsoftware.co.uk, recommended titles include Bibleworks (at up to 21% off RRP), Hebrew Tutor, Davka Biblical Hebrew, check out our list of Jewish software and Hebrew software. Biblical Hebrew made easy Unit 3, Unit W Word Studies, Unit B Bereshit (Genesis) and Unit T Tehillim (Psalms) in development. A self-study Biblical Hebrew correspondence course with optional Email/postal tutoring and/or private/group tutorials. The course is modular in design aimed at all ages and abilities and covers both the language and the worldview of Biblical Hebrew. The "BIBLICAL HEBREW made easy" course is outlined, unit by unit, including sample pages and future developments. Students now number several hundred and are found on five continents. Our student directory means that we can put you in touch with other Hebrew students in the area where you live. Already some have formed mutual study groups and in the UK, tutorial groups. If you visit student quotes you should find a dozen or more unsolicited student comments, apart from the verbal ones that we have received. Computer software is available for Hebrew/other language wordprocessing - see BMSoftware below. An online introduction to Biblical Hebrew and the Hebrew alphabet. The nature of the Hebrew Bible, its easy language and small vocabulary yet deep concepts. 'The Word' in Hebrew. Introduction to and significance of the Hebrew alphabet. Acrostic Psalms. Picture letter origins. Why 22 letters? Regularly updated in depth Hebrew Word Studies and their Biblical implications. Non-academic yet thorough and unpatronising learning methods for all ages and abilities. New letters, broader words, deeper meanings. Worldwide prices and ordering details. Additional Course material, corrections, revisions and updates for existing students. Insights from the Jewish Mishnah, Talmud and midrashim. Full index and site map of the "BIBLCAL HEBREW" web pages. Biblical Studies: Courses and Articles. Self-study/distance learning Bible Study courses in text, audio and computer based learning formats. Many with a Hebraic, Jewish roots, or Early Church foundation. BMSoftware - Biblical and Multilingual Software including Bibles and Books on cdrom, multilingual wordprocessing in all the world's languages (including Hebrew, Greek & Arabic), translation software for European, Russian and Hebrew languages. Over 1000 Christian, Jewish, biblical, Greek, Hebrew and religious software titles including religious clipart and images. Links to other sites of Hebrew, Biblical, Web and Software interest. How to contact us via Email, Letter, Fax, or Phone.